For the dressing, combine the Parmesan cheese, parsley, mayo, vinegar, garlic, cayenne and salt and pepper in a blender and process until the dressing is smooth. Store in the refrigerator until ready to serve. The dressing can be made up to two days ahead of time. 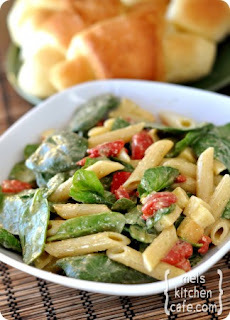 To prepare the salad, cook the pasta in a large pot of salted water until just tender, al dente. Drain the pasta into a colander and run cold water over it and drain well. In a large mixing bowl, combine the cooked pasta, spinach, roasted red peppers and smoked mozzarella. At this point, the salad and dressing can be refrigerated for a couple of hours separately before serving. *Note: This salad would be delicious with grilled chicken pieces tossed in or served alongside. Also, the salad can be made up to two days in advance. Store the dressing in a container, the pasta base in a container and add the spinach and dressing to the pasta right before serving. If you can't find smoked mozzarella, many other cheeses could be subbed - regular mozz, fontina, feta - the options could be endless with this salad!